Brigadier General David W. Hiester was born in Indiana in 1914 and graduated from the United States Military Academy in 1936. Prior to his arrival at Aberdeen Proving Ground in 1962, he had completed a number of important assignments, including four years as a faculty member at West Point between World War II and the Korean Conflict; several tours in Korea, the last as Ordnance Officer for the Eighth Army, where he supplied ordnance materiel to some 600,000 personnel; and the command of Letter­kenny Army Depot. His most outstanding contribution to Ordnance, however, came during his 52-month tour as Commandant of the Ordnance School from 1962 until 1967. He assumed command just as the Office Chief of Ordnance was being dismantled as part of a Defense Department reorganization. Simultaneously, Ordnance training was being stepped up because of the developing Vietnam Conflict emergency. An officer candidate school had to be reinstituted at Aberdeen, and the Ordnance School was pressed far beyond the rated capacity of its staff and facilities. General Hiester was looked upon as the Army's principal advisor on Ordnance matters during this critical period. He was called upon to redefine the mission, policy, duties, and responsibilities of the Ordnance Corps, and also served on the Army's Board of Inquiry on Army Logistics Systems. His dedicated professionalism enabled him to perform his many demanding tasks and to keep the Ordnance Corps intact at a most critical time in its history. 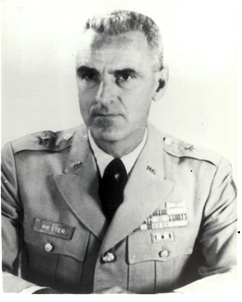 General Hiester retired in 1967.